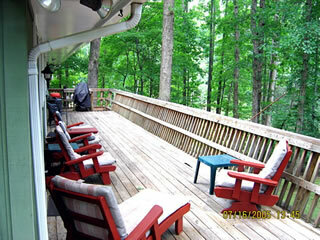 Sit on the deck and be amazed at how peaceful a Smith Mountain Lake Vacation rental is. Are you searching for a place to get away from the hussle and bussle of your busy life? Just need to get out of the city and back to nature? Your search is now over! Welcome to beautiful Smith Mountain Lake. Nestled in the foothills of the Blue Ridge Mountains is an unspoiled paradise just waiting to be explored. If you are adventurous you may want to try some deer hunting or parasailing. If you are a sportsman you will want to bring your fishing gear as this is the largest fishery in Virginia. If your idea of fun is simply soaking up the sun on your own private dock all you need to bring is the sun tanning oil. Peaceful serenity is waiting for you. Are you ready? Lake Retreat is a peaceful, quiet escape from the hectic pace so many of us live. This 4 bedroom, 2 full and 1 half baths home offers over 2,000 sq ft of living space. Located on a waterfront lot with 1.25 acres full of blooming shrubbery and large oak trees, nature and wildlife is at your doorstep. A short walk from the back deck down a mild slope to the water reveals a natural sand beach and two private docks for your use nestled back in a cove. There is a sandbox near the natural sand beach for little children. You and your children can enjoy swimming in the cove and feel perfectly safe from boat traffic and waves. The old and the new docks provide ample docking space for your boats. There is plenty of parking for cars and boat trailers on the lot. Please note the fourth bedroom is downstairs in the unfinished basement and is a combined recreation/bedroom with its own full private bathroom and one queen sized futon. We have central heat and air conditioning and satellite TV in the living room and master bedroom. The kitchen is very well equipped with all the appliances, cutlery and items you need to prepare gourmet meals. Amenities include a ping pong table, adult air hockey game, games, books, puzzles, television, DVD player, BBQ and large deck overlooking our lakefront private docks. For the fishermen, the citation stripers await your arrival.